The following report was published by the News Straits Times, Malaysia’s MSM newspaper, quoting previously published articles by Global Research pertaining to the downing of MH17. This constitutes and important development. Listed below are selected GR references pertaining to the downing of MH17 by a military aircraft, which were used as source material for the NST article. They also denied all allegations made by the Russian government and said the country’s core interest was in ensuring an immediate, comprehensive, transparent and unbiased international investigation into the tragedy by establishing a state commission comprising experts from the International Civil Aviation Organisation (ICAO) and Eurocontrol. “We have evidence that the plane was downed by Russian-backed terrorist with a BUK-M1 SAM system (North Atlantic Treaty Organisation reporting name SA-11) which, together with the crew, had been supplied from Russia. This was all confirmed by our intelligence, intercepted telephone conversations of the terrorists and satellite pictures. “At the same time, the Ukrainian Armed Forces have never used any anti-aircraft missiles since the anti-terrorist operations started in early April,” the statement read. 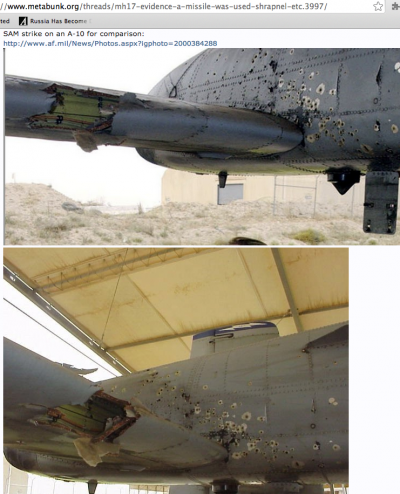 Yesterday, the New Straits Times quoted experts who had said that photographs of the blast fragmentation patterns on the fuselage of the airliner showed two distinct shapes — the shredding pattern associated with a warhead packed with “flechettes”, and the more uniform, round-type penetration holes consistent with that of cannon rounds. Parry’s conclusion also stemmed from the fact that despite assertions from the Obama administration, there has not been a shred of tangible evidence to support the conclusion that Russia supplied the rebels with the BUK-M1 anti-aircraft missile system that would be needed to hit a civilian jetliner flying at 33,000 feet. In the CBC interview, the reporter in the video preceded it with: “The wreckage was still smouldering when a small team from the OSCE got there. No other officials arrived for days”. “There have been two or three pieces of fuselage that have been really pockmarked with what almost looks like machinegun fire; very, very strong machinegun fire,” Bociurkiw said in the interview. Parry had said that Bociurkiw’s testimony is “as close to virgin, untouched evidence and testimony as we’ll ever get. Unlike a black-box interpretation-analysis long afterward by the Russian, British or Ukrainian governments, each of which has a horse in this race, this testimony from Bociurkiw is raw, independent and comes from one of the two earliest witnesses to the physical evidence. “That’s powerfully authoritative testimony. Bociurkiw arrived there fast because he negotiated with the locals for the rest of the OSCE team, who were organising to come later,” Parry had said. “You can see the entry and exit holes. The edge of a portion of the holes is bent inwards. These are the smaller holes, round and clean, showing the entry points most likely that of a 30mm caliber projectile. He deduced that in order to have some of those holes fraying inwardly, and the others fraying outwardly, there had to have been a second fighter firing into the cockpit from the airliner’s starboard side. This is critical, as no surface-fired missile (or shrapnel) hitting the airliner could possibly punch holes into the cockpit from both sides of the plane. “It had to have been a hail of bullets from both sides that brought the plane down. This is Haisenko’s main discovery. You can’t have projectiles going in both directions — into the left-hand-side fuselage panel from both its left and right sides — unless they are coming at the panel from different directions. “Nobody before Haisenko had noticed that the projectiles had ripped through that panel from both its left side and its right side. This is what rules out any ground-fired missile,” Parry had said. 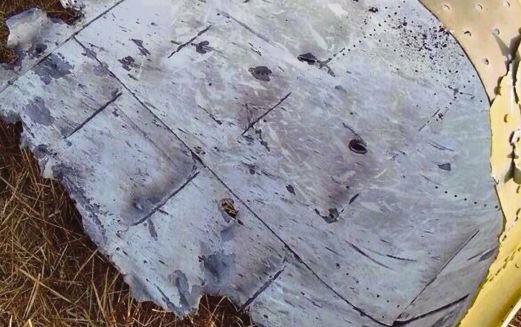 “Support MH17 Truth”: OSCE Monitors Identify “Shrapnel and Machine Gun-Like Holes” indicating Shelling. Washington’s Determination to Drive the World to War”: Will Putin Realize That Russia Holds The Cards?